A fair maiden – Eily O’Connor, nicknamed the Colleen Bawn – lives on the other side of the lake. The man, Hardress, to whom she is secretly married plans to marry another, Anne, since his first wife’s use of the vernacular ill-befits his social standing. A friend Kyrle has long carried a flame for Anne. And Hardress’ mother has a problem with her mortgage which could see them all homeless unless she repays the twisted magistrate landowner, or accepts his hand in marriage. Throw in a hunchbacked servant Danny who reckons one of the chess pieces could be permanently lifted off the board, a stray shot and a happy ending and you’ve got a convoluted tale based on a true story that was adapted into Gerald Griffin’s novel The Collegians. First performed in 1850 in New York, Dion Boucicault’s melodrama The Colleen Bawn has been given the full Bruiser treating, with seven cast members playing many more characters with instant costume changes, quick asides to the audience, props thrown across the stage and scene changes that are nearly a rapid fire as the dialogue. 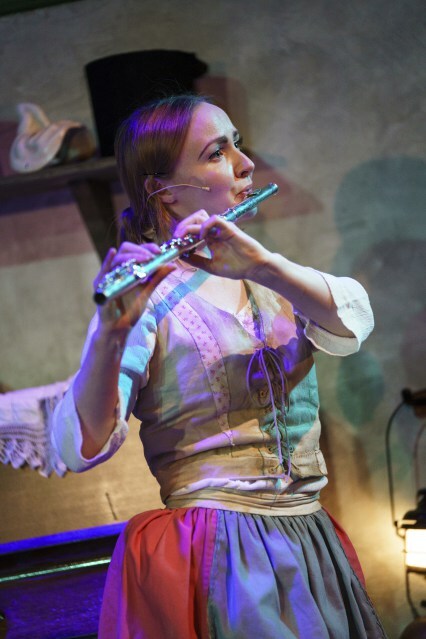 The first half is peppered with on-stage music from the cast of seven with three guitars, fiddle, flute, piano, tin whistles, percussion and great harmony voices injecting gusto into the plot that swirls around the audiences brains unless they’ve read the synopsis beforehand. The issues of class and dialect surrounding secret wife Eily drive the contemporary commentary stirred up by the play, and the reprise after the interval is incredibly useful to reduce the brain power being consumed by piecing together the story to begin to analyse what is going on underneath the dialogue. The live music mostly disappears in the second half with Matthew Reeve’s soundtrack taking over and Grace Smart’s oak-beamed, low-ceilinged set providing the novelty. 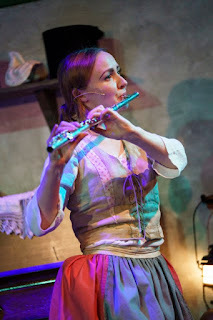 The ensemble is incredibly tight and Lisa May’s direction creates a focus for each scene despite the majority of the cast staying on stage during the full performance. Patrick McBrearty’s Danny carries the most pleasing west-coast accent. 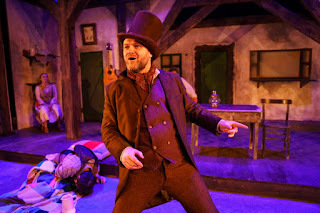 With a simple twirl, Cavan Clarke morphs from double-dating Hardress into the unorthodox Father Tom.Enda Kilroy bounds around the stage with a comedy-sized top hat worn at a jaunty angle like a superhero playing the local magistrate and wannabe detective. 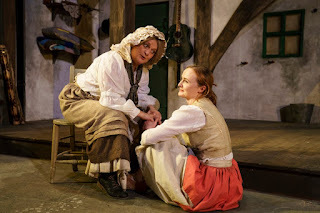 Maeve Smyth captures the grace and simplicity of Eily, and is probably a little more ‘Colleen Ruaidh’ than dark-haired Colette Lennon Dougal (Anne) whose character attracts this moniker and is played with a spirit of always looking on the bright side. Jo Donnelly steals scenes and with her eyes and her great sense of comic timing. Today’s Sunday matinee audience probably contributed to the performance being more sober than farcical. 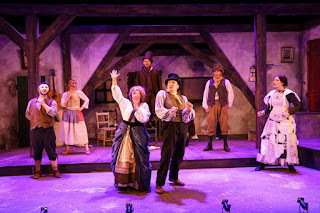 The overall the pace was much more comfortable than Bruiser’s overly manic The 39 Steps and it was an amazing choice of script to show off what Bruiser can do to bring out the jest and joy in a play. 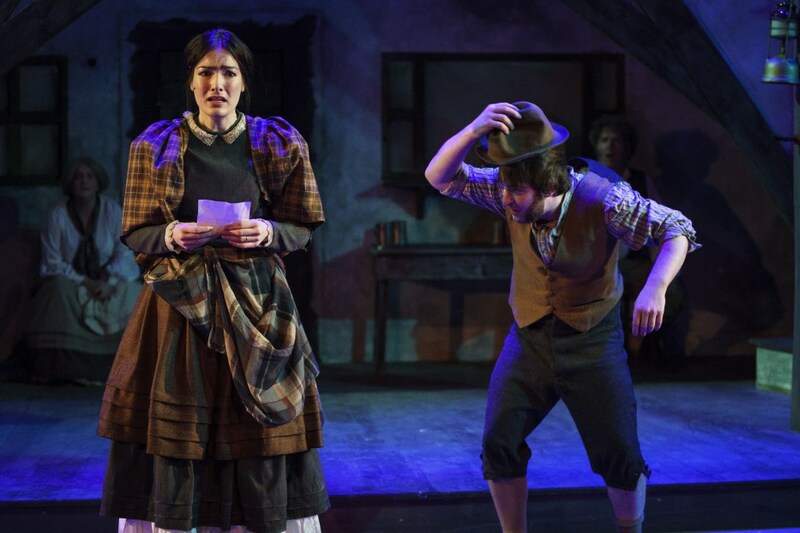 The Colleen Bawn runs until Saturday 28 April and is a co-production between the Lyric Theatre and Bruiser Theatre Company. 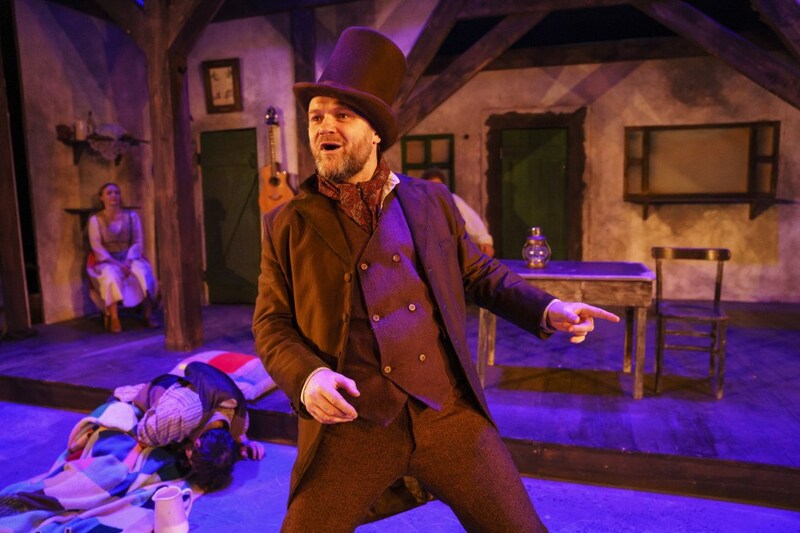 In a week that saw Bruiser Theatre lose 85% of its Arts Council grant, this quality production once again proves the company’s pedigree and distinctive place in the NI theatre sector.